We are passionate about horses. We love being around them, riding them, training them, bonding with them, and caring for them. 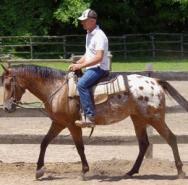 We work with all breeds and have a gentle trainer with show experience in Ontario, Quebec, and Northern United States. Working with horses indoor and outdoor, Randy Propper trains for all different equestrian purposes such as preparing for showing, thoroughbred racing, jumping, and just to have fun riding. We also offer Ranch Getaways, Lessons and Camps!